Atheneum Books for Young Readers, 9781416979050, 40pp. 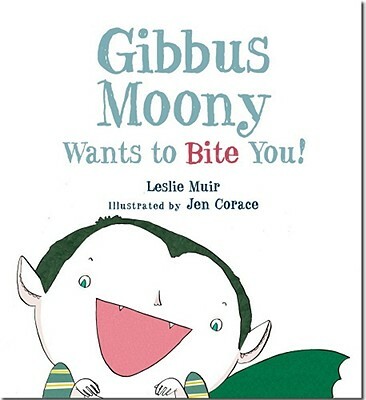 Gibbus Moony’s grownup fangs have finally grown in. Now all he wants to do is chomp on something juicy! All day Gibb hunts high and low for his first unsuspecting victim. But just when he thinks he’s found the perfect bite, he may discover something even more fangtabulous to sink his teeth into. Get ready for a totally toothsome tale! Leslie Muir is a writer, painter, and poet. She is the author of Gibbus Moony Wants to Bite You!, illustrated by Jen Corace; forthcoming Barry B. Wary (Disney-Hyperion, May 2011), to be illustrated by Carrie Gifford, and The Little Bitty Bakery (Disney-Hyperion, August 2011), to be illustrated by Betsy Lewin. Leslie lives in Atlanta, Georgia with her husband and two sons.You can visit her at lesliemuir.com. Jen Corace is the illustrator of Little Pea, Little Hoot, and Little Oink by Amy Krouse Rosenthal. She graduated from the Rhode Island School of Design with a BFA in illustration. She also creates fine art, with a focus on the Victorian and Edwardian eras. You can visit her at jencorace.com. "Corace is on familiar ground: she's proved herself to be a virtuoso at portraying unlikely but thoroughly likable rebels...an offbeat take on the popular culture's vampire obsession."